Lara Croft has been raiding tombs for almost 20 years. The game’s evolved along with Lara’s look and it’s pretty spectacular—Rise of the Tomb Raider is indeed Lara rising to claim her rightful title. The world is beautiful and it almost feels real—all throughout the campaign I knew I should press on, but I couldn’t help but explore every crevice. Despite not being fully open world, I never felt limited. It’s a game full of adventure and each map is ripe with relics and history. 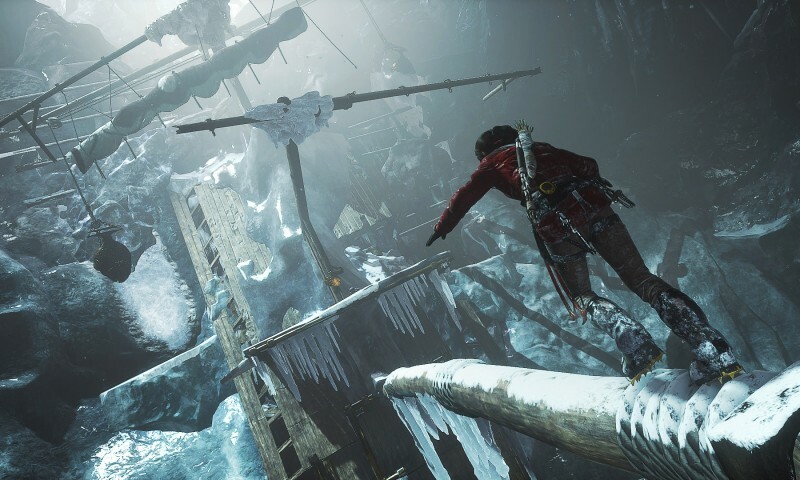 In Rise of the Tomb Raider franchise, Lara’s following in her father’s footsteps by chasing down something called a divine source, a mysterious artifact that may have something to do with immortality. She isn’t the only one who knows about it though—a group calling themselves Trinity are after it as well and they do not play nice. So many of my deaths came from taking on too many on at once. They’re ruthless, with deep roots in history and they want that divine source with a fiery passion. As you explore, it feels like Lara is always growing and learning—every document, mural or monolith you read levels up your language skills. Everything else you find gives you experience points so you can learn new skills in three different categories—brawler, hunter, survivor. These you can upgrade at base camp. Each branch has 15–20 skills you can master, so you can decide whether to be a great fighter, mighty hunter or hardy survivor. You choose how fast you want to gain the experience—you can do the bare minimum of side content, but you move through the story quicker or you can take your time and get skill points fairly frequently. The base camps are spaced well throughout, and I usually had something to craft or upgrade at each campsite. You also upgrade your equipment and weapons at base camps. This requires a little more work on your part—everything you need for upgrades is out there in the wild, you just have to find it. Luckily, your survival instincts can help you find it—pushing in the right joystick lights the world up, showing you everything of importance. Anything you can use to craft ammo, healing items or bombs is boldly outlined for you. It’ll also point out escape routes, or an important piece of a puzzle, but the best thing it highlights are the relics and documents that give you backstory to what you’re fighting for–or against, in some cases. The tomb raiding and puzzle solving is top notch—because everything looks so natural, it’s hard to spot what’s out of place. It wasn’t really the core of the campaign, but every time one popped up, I spent an hour or so exploring every nook and cranny. Not only are there coin caches and historical documents to find, there’s also challenges to complete in every tomb, like shooting lanterns and the like. You can replay the tombs whenever you want and add in some extra challenges to keep them from going stale. It feels like it’s Lara against the whole world sometimes—Trinity isn’t the only enemy she finds out there in the wilderness. There are plenty of predatory animals thinking she’s prey and they don’t go down easy. My favorite death in the game came at the claws of a snow leopard who caught me by surprise and bit my throat out—yup, the fun, graphic death scenes are back and as brutal as ever. There’s no pre-rendered cut scenes, and Lara is quite the star. She’s vulnerable and badass all at the same time and she’s got a powerful need to understand everything that’s happening. There’s a ton of content in the campaign—between the hidden tombs and all of the historical documents littering the landscape, you have plenty of reasons to play this game for days. Completing everything is a monumental task that’s well worth the undertaking. It’s a beautiful world to delve into, and it’s a fun adventure worth taking.